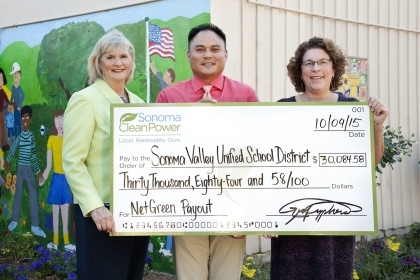 School District Superintendent Louann Carlomagno, at right, accepts a $30,000 check from Sonoma Clean Power, represented by board member Susan Gorin and CFO John Bartolome, at Prestwood Elementary School. The exact number represents the amount of surplus electricity the district has generated in the past year through its network of solar arrays that provide energy to SVUSD schools and facilities. Its solar network offset 100 percent of the energy used by the district, resulting in an annual savings of about $1 million a year. 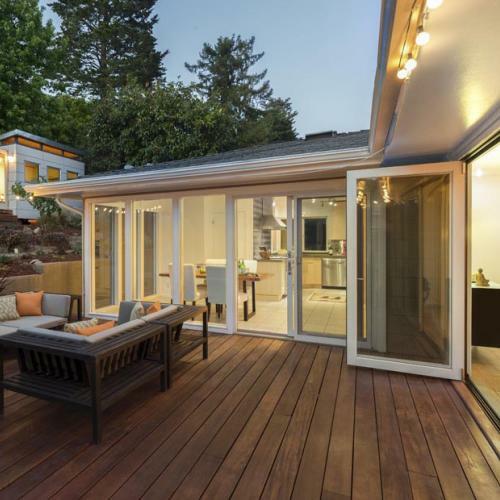 We are thankful that the community supported our efforts to improve educational opportunity, conserve resources, and generate clean power by voting for a 2010 bond measure to finance the construction of solar panels. Our solar arrays allow us to save money and reinvest those dollars back into our schools and students.